Lust. It’s such a strong word isn’t it? I lusted after an ice cream maker for SO long. I kept seeing posts all over the food blog world about homemade ice cream. Finally, I caved in, and bought one, sneaky-style as a last second bid on eBay. When it finally came in I knew I wanted to make a simple and delicious ice cream, without crazy flavors or a lot of mix-ins. 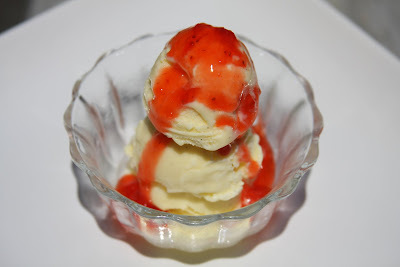 Then I saw this post for Buttermilk Ice Cream in Smitten Kitchen‘s blog. 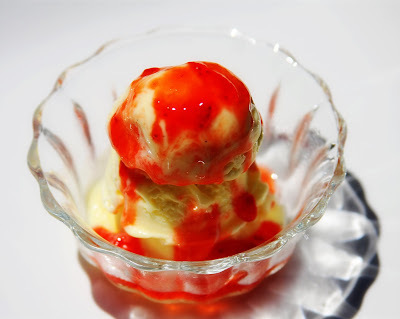 The idea of a buttermilk ice cream was something I’d never tried before. I was intrigued, and decided it would be the inaugural batch of ice cream! I used real a vanilla bean, and also followed her tip that you didn’t need to use the twelve egg yolks the recipe originally calls for. I used 6 yolks, and still felt it was super creamy. Churning the ice cream was a truly magical experience. I was so excited when it finished. The custard really did churn itself into ice cream! It was soft serve at first, but after a little bit of time in the freezer, it hardened into a scoopable treat. The Boy, believe it or not, isn’t a huge ice cream fan. I did convince him to try the ice cream and he thought it was good, but I guess it wasn’t enough to tempt him to eat a bowl of it. What a weirdo. But I do have him to thank for targeting the flavor. The buttermilk gives it a sweet tartness. He’s the one who first described it as almost like cheesecake! I think this ice cream would be great with graham crackers crumbled up, or topped with blueberry syrup. Or, if you’ve got GREAT FRIENDS who share with you their homemade freezer jam made from fresh picked strawberries, then you are very lucky. I just happen to be that lucky. My good friend Jamie made me some jam. When she told me she really enjoyed it best on ice cream, I knew instantly that I would use it as a topping on the last tiny little bit of this buttermilk ice cream I had remaining in the freezer. I had rationed the ice cream to save enough for a picture as I never got around to photographing it! Inspired by Jamie’s jam, I pulled out the ice cream, scooped and stacked it up, topped it with the sweet jam, and took it outside for a little photoshoot. 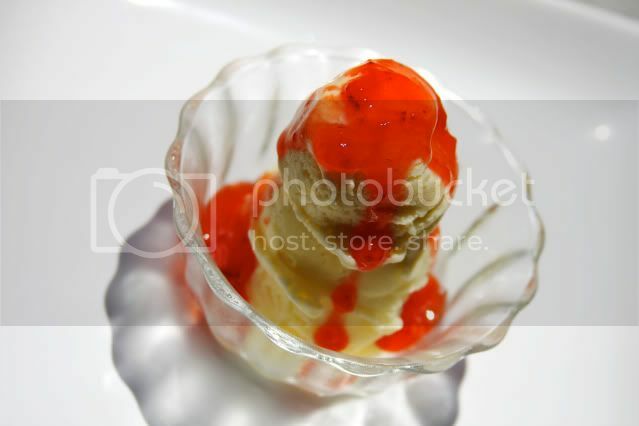 I must say, for my first photoshoot with ice cream, I’m pretty darn proud of myself. After the photoshoot I stuck it back in the freezer, and later on that night I ate it. Wow… The tart ice cream, plus the sweet jam, is such a good combination. If I didn’t already have 25 ice cream recipes bookmarked, I’d be veeeeery tempted to make this again just to be able to enjoy it with the rest of Jamie’s jam. I’m submitting this in Joelen’s Tasty Tools event for June, which is featuring ice cream makers! Be sure to check back at the end of the month for her round up of all the recipes submitted. And check out her other fun foodie events! Hopefully one of these days I will get an ice cream maker…although it is probably best I don't currently have one!! 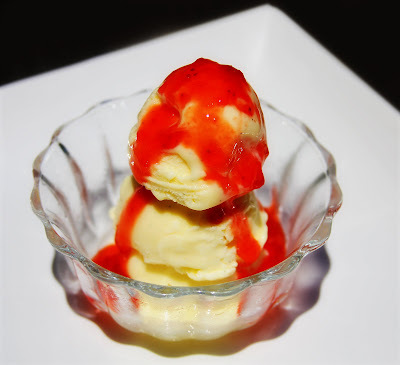 PS – for as long as I have made homemade strawberry jam my secret obsession has always been eating it over ice cream…isn't it AMAZING! Looks yummy! I think I would really love the tartness of it as well. I finally got my ice cream maker out (it was a wedding shower gift that we had never used!) and made a great sorbet the other weekend – I can't wait to use it again! This sounds delish! It was the "boy's" comment about it tasting like cheesecake that has bumped this recipe to the top of my list! Thanks for sharing and good job on the photos. I've been making ice cream and trying to photograph it but can't seem to get myself motivated it enough to blog about them! What an excellent flavor and addition to our Tasty Tools event this month! Thank you for sharing this and submitting it! !